Three weeks of children saying, “I’m bored. I don’t know what to do!” is exhausting and will defeat the most creative adults. At some stage, most of us raise the white flag in surrender and (with shame) give children over to the digital world of entertainment and virtual connection. Alternatively, we give them over to their own ideas (how do we get there!) and spend most of our evening tidying up the mess or at the local clinic getting whatever broke fixed. 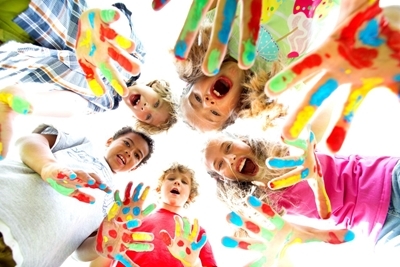 Holiday clubs offer hours of exciting games and imaginative activities for kids. Digital savvy children still enjoy those good-old-fashioned games. Let’s help them NOT grow up so quickly! Even if it starts with an ‘uncool’ game that they end up loving. Growing up is tough in any community. All children need words of encouragement. We all know just how damaging words can be and every adult has been on the receiving end of words which hurt and made us feel less about ourselves. Children also say such mean things to one another. Which adult hasn’t been shocked by what Ayanda said to Babalwa or what John said to Sipho at school! Now of course, there will be other children at the holiday club (there’s no perfect children anywhere) but they will also hear real words of encouragement from the daily teaching. It is fundamentally about free choice. So, hear that your child won’t be forced into the acceptance of any belief. The message advocates acceptance. Acceptance of others and their imperfections. Acceptance of self and all your faults. It promotes value. The innate value of every child as a created person of God. The message at its core is about love. The amazing unconditional love God has for every child. What child wouldn’t benefit from hearing they are loved, accepted and of great value? When I hear something is free I often think there’s some sort of catch and look for the fine print. I’m sure you feel the same. You don’t just get free stuff these days and truthfully, most kids activities are expensive. Holiday clubs are free with no catch. These clubs are a service to the local community. They do cost money to run but these expenses are often covered by generous donations. Children need safe places to play, interact with other children and have loads of fun. Holiday clubs are safe places. Leaders are screened, activities scrutinised, parents/guardians communicated with, and indemnity forms signed. Think about it. Other than with friends, family and school, where else can you leave children for an entire morning with the assurance that they will be safe and have an amazing time? In an ideal society children should learn a healthy identity from their home environment but sadly for many children this will not be their experience. The volunteer leadership teams at a holiday club are wonderful examples to kids and may even become a mentor to them over time. The Nonprofit, Scripture Union South Africa (SUSA) is involved in holiday clubs. They reached 12 533 children in 2017. During the holiday period each year, thousands of young people are left to their own vices. This presents an opportunity for communities to engage with these young people and help shape their destinies for good. We at Scripture Union run contextual non-residential holiday clubs that have become a feature in many communities. For no cost, children enjoy fun activities and receive mentoring in the context of their families, communities and churches, by a team of trained and committed leaders, acquainted with the values of SU. These venues provide a safe zone for young people to spend their holidays while their parents are at work. Sending a child to holiday clubs is an investment in them and the future of our country (and they’ll love it!). Contact a SU regional office to find out more about holiday clubs in your community.